The largest World War II re-enactment in the Midwest commences Sept. 23-24 on the 148-acre campus of Midway Village Museum in Rockford. It involves more than 1,300 re-enactors from 40 states and even a few from other countries. Now in its 21st year, the event will attract 11,000 visitors eager to see booming battles, 60-plus authentic military vehicles and 1,300 costumed re-enactors in character. Themed events occur throughout the day, such as Russian Front or Invasion of France 1940. Thirteen buildings are filled with displays of World War II artifacts and Midway’s 1900-era village is transformed into a 1940s Nazi-occupied French village. Based on crowd size, it’s obvious that World War II Days has earned a solid fan base. Less well-known, however, is the Education Day that precedes it. It’s an opportunity for teachers, students and homeschoolers to have the campus all to themselves. The museum initiated Education Day in 2003; this year it takes place Sept. 22 from 9:30 a.m. to 2 p.m. Rather than being lost in a crowd of 4,000, the 800 or so students – mostly middle and high school ages – receive the full attention of re-enactors and, remarkably, a World War II veteran guest speaker. There are many hands-on activities, and re-enactors are in full dress rehearsal with their authentic costumes, gear and vehicles. Students can run an obstacle course, complete with a drill sergeant barking orders, to get a feel for what U.S. Army Basic Training was like. They witness themed skirmishes and skits in the Nazi-occupied French village. In the schoolhouse, they learn about code breaking and try their own hand at it. In the print shop, students make the French identity papers they need to carry at all times, lest they be stopped by a German patrol. Students can watch radio-controlled World War II airplanes fly and learn how the Army Air Corps morphed into the U.S. Air Force because of World War II. They also experience the home front, touring victory gardens and learning about the many sacrifices and efforts made by civilians to support the war effort. This is Hoeker’s third year of coordinating World War II Days. She’s impressed by the respect students have shown both to re-enactors and the World War II veteran guest speakers. This year, that speaker will be Richard Lockhart, who served from 1943 to 1945, was in the Battle of the Bulge and was a prisoner of war. Most teachers do a good job of preparing students for the immersive experience, says Hoeker. The event happens early in the school year, but teachers have told Hoeker they find themselves referring back to student experiences from World War II Days Education Day all year long. One of the many good things about this event is the wide array of nations represented by re-enactors portraying soldiers, nurses, French Resistance members and more. Uniformed re-enactors represent the U.S., Great Britain, France, Poland, Ukraine, Russia, Japan, Italy, Germany and many other nations. When doors open to the public on Sept. 23, World War II Days will offer a jam-packed event schedule. Last year, many new items were added in celebration of its 20th anniversary and nearly all will make a comeback. They include period musical performances; a photography exhibit titled “20 Years of Midway Village Museum World War II Event;” a display of World War II radio-controlled model airplanes; and a parachute-making craft. This year will also bring a 36-panel educational display about the Holocaust, on loan from the Illinois Holocaust Museum. “It’s another element to the overall story of the war,” says Hoeker. Back by popular demand is a special Friday-night event titled “Behind the Lines with General Patton,” from 5-8 p.m. Participants will enjoy a guided tour of camps and vehicles before the event opens to the public. They’ll hear from re-enactors representing more than a dozen countries involved in the war, tour Gen. Patton’s tent, then sit down to dinner and listen to a special presentation by a Patton living historian. Tickets are $35 for non-members and $30 for members. Pre-registration is required by Sept. 13. Sadly, fewer World War II veterans attend World War II Days each year. Those who do are treated to free admission, reserved seating and assistance moving about the grounds on golf carts. Admission to World War II Days is $14 for adults and $8 for children ages 3 to 17. Midway Village Museum members are free. Tickets are sold online, in the museum gift shop and at the gate. Shuttles run from the parking lots and also within the event to accommodate people who need assistance. 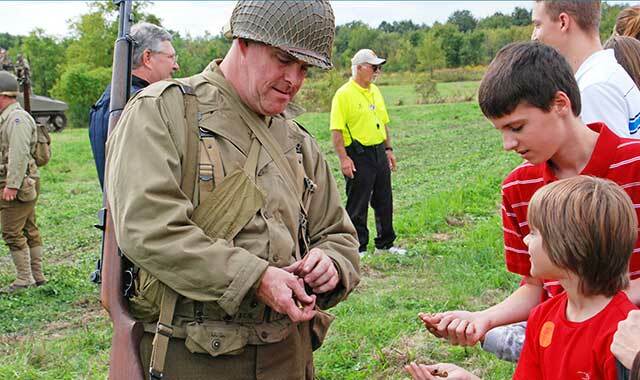 To register your student group for World War II Days Education Day, go online to midwayvillage.com/midway-hands-on-history.html or call Kristen Hoeker, special events coordinator at (815) 397-9112, ext. 104. The registration deadline for Education Day is Sept. 14. Admission to Education Day is $1 for adults and $7 for students. If the $1 seems cheap, it’s by design. “We like to encourage adult chaperones to attend,” Hoeker explains. Find a complete schedule of World War II Day events at midwayvillage.com or call (815) 397-9112. This entry was posted on Tuesday, July 18th, 2017 at 12:00 pm	and is filed under Recreation & Destinations, Top Posts. You can follow any responses to this entry through the RSS 2.0 feed. Both comments and pings are currently closed.